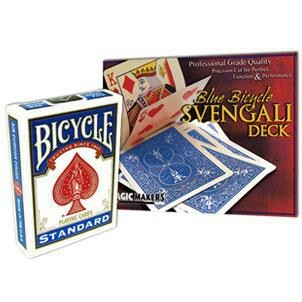 Svengali Deck in Bicycle Blue Back - Precision Cut & Sealed High Grade from Magic Makers, Inc. More than 100 years ago, Burling Hull created this Amazing magical illusion with cards. Now you can own and easily perform this miracle with cards… Using this deck you show that all of the cards are different, a spectator freely selects a card and then all the cards become that selected card. A quick learn web video link is available with the purchase of this deck. Magic Makers also has a wide number of teaching DVDs on this deck, so you can learn step-by-step. The Magic Makers Svengali Decks in Bicycle are the highest quality ever made. They are precision cut and embossed finished for the perfect function and performance every time you are ready to go.